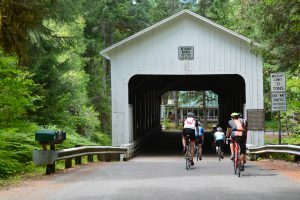 After reluctantly leaving the outdoorsy paradise of Oakridge (and probably vowing to return some day soon), you’ll ride past the Office Covered Bridge at Westfir. This scarlet beauty is Oregon’s longest covered bridge and something unique to this part of the country, and apparently Madison County, Iowa. 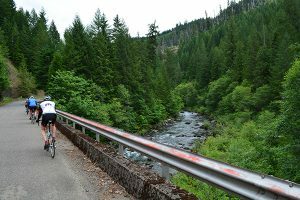 Beyond the bridge, the route will soon deposit riders onto the Aufderheide Scenic Byway or the far less exotically-named Forest Service Road 19. 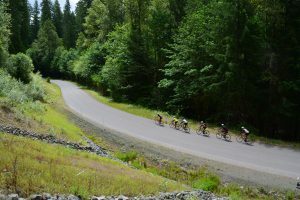 The Aufderheide is a gentle climb through the forest, following the Middle Fork of the Willamette River to lunch at the summit at Box Canyon. You will really have to earn your lunch today (eat the cookie first!) because the last 2 miles before the summit come with an 8% grade that looks tougher than it really is. Once you arrive at lunch, the remainder of the day consists of 26 miles of speedy, swoopy downhill! Tuck this little thought away in the back of your mind during the climb and you’ll do just fine. Heading downhill from lunch and Box Canyon, the route follows the South Fork of the McKenzie River past Terwilliger/Cougar Hot Springs (clothing optional, wink wink) and Cougar Reservoir towards our stopping point in Rainbow. During today’s fast descents, please remember to be considerate of other riders’ comfort levels. Give everyone some space and tap the brakes when necessary. Once you reach Cougar Dam, there will be a short, steep downhill with the McKenzie River at the bottom. As a perfect covered bridge bookend to the day, you will cross the Belknap Covered Bridge just before the finish. *Disclaimer: The range will be closed and no one will actually be hitting golf balls at campers. Click here for more details about the Classic and to register.